In order to resolve this regional conundrum, China and the United States have no choice but to engage each other and maintain regular communication on how they can coexist while advancing their respective core interests. After all, the Asia-Pacific region is big enough for both countries to share and exert their respective influence without pointing fingers at each other. As China’s rise triggers a shift in the regional balance of power, the United States needs to acknowledge China’s core interests of ensuring its sovereignty and maritime claims in the South China Sea. Similarly, China must respect the legitimate interests of the United States in the South China Sea, especially freedom of navigation in line with UNCLOS, which it is also in China’s interest to protect. The conflict in the South China Sea has evolved from a territorial and maritime dispute between China (including Taiwan) and the other four claimant states into a show primarily featuring the United States, as a strong maritime power and a user-state of the South China Sea, and China, as a growing regional maritime power struggling to pursue its maritime interests as a coastal state. China and the United States, both possessing legitimate interests in the South China Sea, have divergent views on several issues: freedom of navigation, the arbitration case, state practice of international law, maritime dispute management, and land reclamation activities. The outstanding question remains whether common interests will succumb to divergent ones, leading to future confrontation between the United States and China. This analysis suggests the answer is no. The recent patrols performed by the U.S. Navy vessels Lassen, Curtis Wilbur, and William P. Lawrence stem from the U.S. policy of testing freedom of navigation in the South China Sea. Both China and the United States view freedom of navigation as vital to their national interests, but they differ on the proper exercise of that freedom in at least two ways. The guided-missile destroyer USS Lassen (DDG 82) in the eastern Pacific Ocean, March 2016. U.S. Navy photo by Petty Officer 2nd Class Huey D. Younger Jr.
First, they disagree on whether certain types of military activities in coastal states’ exclusive economic zones (EEZ) fall within the scope of freedom of navigation. The categories of military activities that have proved controversial include those potentially having an impact on the marine environment and those that could be categorized as marine scientific research requiring prior permission from coastal states. Second, while China and the United States do not contest the existence of a right of innocent passage in territorial seas under the 1982 UNCLOS, they differ on the specific rights of warships. The United States believes that warships enjoy the same right to innocent passage as commercial vessels, whereas China mandates in its domestic law that the flag states of warships exercising innocent passage must obtain prior permission from coastal states. Article 30 of UNCLOS stipulates that a coastal state may require warships to leave territorial seas immediately if the warship does not comply with the laws and regulations of the coastal state. Despite divergent legal treatment of warships and innocent passage, both China and the United States have conducted their operations in a strict and lawful manner during freedom of navigation operations. China’s official protests are mostly motivated by political and security concerns rather than by a deep commitment to the interpretation of international law. Thus, freedom of navigation is not the key issue separating China and the United States. The United States has called on China to act in conformity with international law and norms. What principles of international law has China breached? Has China violated Article 2 (par. 3) of the UN Charter by avoiding “peaceful means” of dispute settlement? Has China disregarded Article 4 of the 2002 Declaration on the Conduct of Parties in the South China Sea (or Article 2 (par. 4) of the UN Charter on which it is based) on resolving disputes “without resorting to the threat or use of force”? Has China ever threatened the use of force to take back its lost territories—the land features in the South China that are occupied by other claimant states? The answer to these questions is no. What China has done since the 1980s has been to propose shelving sovereign disputes and proceeding with joint development. 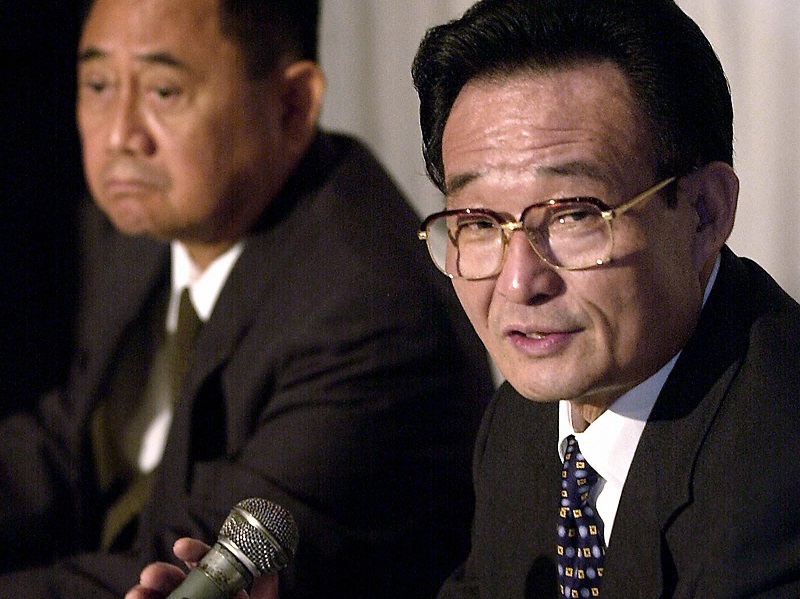 Chinese parliamentary leader Wu Bangguo speaks during an August 2003 trip to Manila. Wu discussed a joint oil exploration and development plan for the Spratly Islands. JOEL NITO/AFP/Getty Images. What, then, is the United States indicating when it insists that China respect international law? The real driver of U.S. complaints is a divergence in state attitudes toward alternative methods for managing or settling international disputes. The United States has explicitly endorsed the Philippines’ choice of third-party compulsory dispute settlement. China has valid reasons for rejecting this method, including persistent doubts about the justiciability and admissibility of the case, a preference for alternative methods of solving disputes with its neighbors, and skepticism that the final award will bring Beijing and Manila closer to resolution of the dispute rather than trigger a further escalation of tensions, continuing the current trend. Without discrediting or underestimating the important role that compulsory dispute-settlement regimes can play, Southeast Asian countries have historically been more amenable to alternatives such as confidence building, joint development, negotiation, and mediation. China certainly does not enjoy being or seek to be portrayed as the regional bully that disrespects international law. It is, however, rational and within the sovereign rights of a state to choose its preferred and most comfortable method for problem solving. This principle is well-illustrated by the United States’ decision to pull itself out of the Nicaragua case after it lost in the jurisdiction and admissibility phase. However, in this case China’s decision not to appear before the arbitration tribunal has placed the country in a vulnerable position, as Beijing has forgone the opportunity to lay out its legal evidence in full; the position paper is obviously insufficient. Observers of China’s land reclamation activities have neither grounds for criticizing the projects nor any real cause for concern, as these activities have no legal implications according to any interpretation of UNCLOS or general international law. The issue of which state has the better claim to sovereignty is governed by the rules and principles of international law on the acquisition and loss of territory, which are set out in the decisions of international courts and tribunals. Hence, China’s land reclamation activities do not strengthen, weaken, or in any way affect its claims to sovereignty over the features in the South China Sea. In addition, these activities will not enhance China’s maritime boundary claims either, given that UNCLOS precludes artificial islands from generating rights to a territorial sea, an EEZ, or a continental shelf. China is frequently accused of ignoring its duty to give due notice and appropriate publicity of its land reclamation projects and of not undertaking environmental impact assessments (EIA). Official statements from the Chinese Ministry of Foreign Affairs suggest, however, that China has indeed conducted EIAs and that it is continuing to monitor the impact of its reclamation activities. It may be necessary for China to make the EIAs public and clarify which duties to potentially affected states it acknowledges. Beijing should also give due consideration to the responsibilities arising from the construction of the islands by maintaining permanent means for giving warning of their presence and appropriately publicizing their depth, positions, and dimensions. As China defends land reclamation projects as a means to improving its capacity to deliver maritime public services, the country must produce evidence that it is using the reclaimed land for the purpose of maintaining maritime safety and security, offering support for search and rescue operations, and enabling scientific research. The United States has accused China of militarizing the South China Sea through the continued buildup of military forces on the artificial islands, while China condemns the United States’ freedom of navigation operation as de facto leading to the militarization of the region. China defends the construction of facilities on its controlled features as improvements to facilities that are used for search and rescue and other civilian purposes, with military applications extending only to limited defense. The United States claims that its latest gestures in the South China Sea are motivated by a need to assure regional allies that are concerned by China’s growing maritime capacity. These allies tend to forget common interests in the South China Sea, such as the safety and security of sea lines of communication and a peaceful and stable political environment. Bearing this in mind, the atmosphere of mutual suspicion loses its legitimating assumptions. The recent pattern of confrontation and counteraction will lead to nowhere except an intensification of the security dilemma. The South China Sea has a complicated past and an uncertain future, but cooperation and due consideration among nations could stabilize the region and bring tranquility to this important sea lane. It is in the best interests of both China and the United States to explore and develop fields of maritime cooperation, such as search and rescue and humanitarian assistance, which would benefit from coordination between the two navies. PLA Navy destroyer Haikou (DDG-171) in the Gulf of Aden, January 19, 2009, as seen from a French frigate. STEPHANE DE SAKUTIN/AFP/Getty Images. 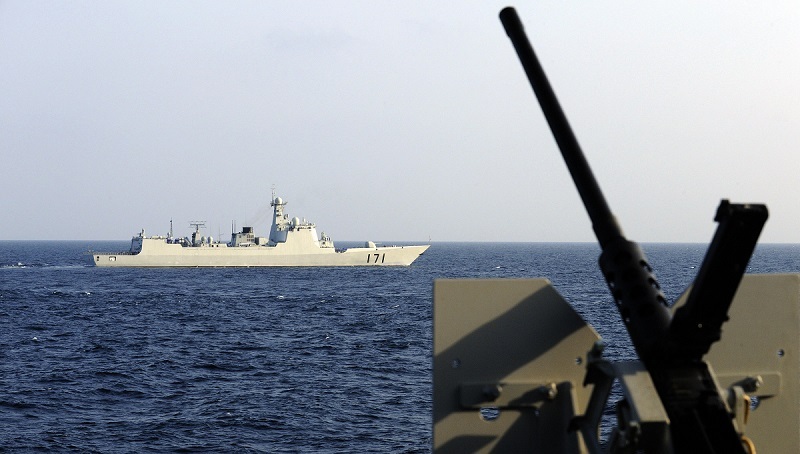 Joint antipiracy efforts in the Gulf of Aden provide one example of successful cooperation. The Consultative Mechanism to Strengthen Military Maritime Safety signed in 1998 laid the groundwork for further confidence-building measures, while the Code for Unplanned Encounters at Sea agreed to at the 2014 Western Pacific Naval Symposium sets a possible model that non-naval vessels can follow when navigating the South China Sea. Likewise, the U.S.-China Memorandum of Understanding on the Rules of Behavior for the Safety of Air and Maritime Encounters, announced after the summit between Xi Jinping and Barack Obama in 2014, is definitely a step forward. These documents, though not binding under international law, serve as a necessary framework for confidence building under the conditions of an increasing trust deficit between China and the United States in the maritime domain, especially in the South China Sea. Banner image credit: © Permanent Court of Arbitration. Merits hearing in the Philippines v. China arbitration, November 2015, The Hague, the Netherlands.